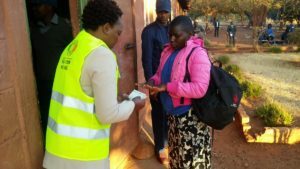 Zimbabweans began voting on Monday in the first election since the removal of former President Robert Mugabe. The election pits 75-year-old President Emmerson Mnangagwa, a long-time Mugabe ally, against 40-year-old Nelson Chamisa, a lawyer and pastor vying to become Zimbabwe’s youngest head of state. The contest could bring international legitimacy and investment or signal more stagnation if the vote is seriously flawed, Associated Press reported. European Union election observers were seen at one polling station in Harare, checking the voting process. African Unions attended the opening of polling stations elsewhere. Former Liberian president, who is also a leader of the international observer missions, has described the elections as “a critical moment in Zimbabwe’s democratic journey”. The former President Robert Mugabe on Sunday called a surprise press conference to “air his views” ahead of Monday’s vote. Mugabe spoke about his desire that people will be allowed to vote in peace and freely. He added that he hoped that the election will usher in a new era of constitutionality and legality. Under Mugabe, elections were marred by intimidation, rigging and widespread violence but the consensus in the build-up to this vote has been better than before. Posted by Khalid Al Mouahidi on July 30, 2018. Filed under News, Zoom. You can follow any responses to this entry through the RSS 2.0. Both comments and pings are currently closed.